Stress is huge in this line of work. 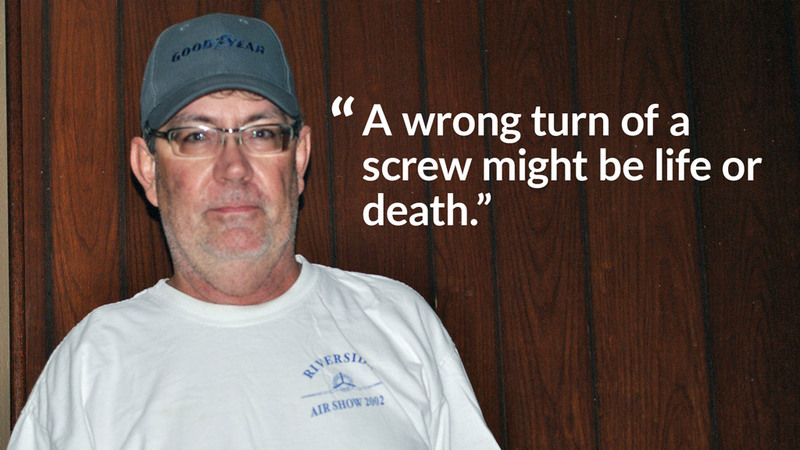 A wrong turn of a screw might be life or death. Your integrity, your name and your FAA [Federal Aviation Administration] license are on the line every time you perform maintenance on an aircraft. The worst stress is when that is true. I not only worked on that aircraft, but knew the pilot as a friend. I love aviation, but being perfect every time is difficult. It's hard on your family life. After 25-plus years, the stress never goes away. I have worked on everything from a Piper Cub to a Boeing 747. I also fly them. Most aircraft mechanics are afraid to fly. It would be like working on a car and being afraid to drive. The average aircraft mechanic makes $50,000 for working on airplanes that cost millions.